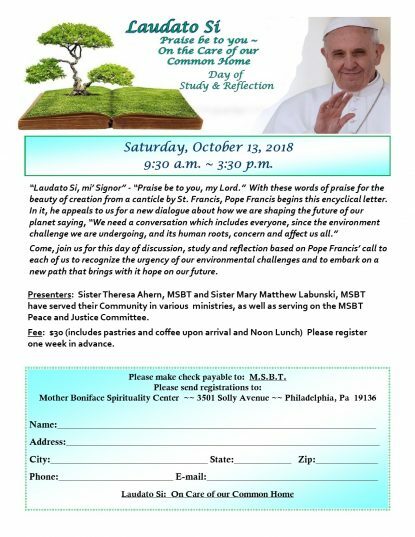 Saturday, October 13, 2018 — 9:30 a.m.
Saturday, October 13, 2018 — 3:30 p.m.
“Laudato Si, mi Signor” – “Praise be to you, my Lord.” With these words of praise for the beauty of creation from a canticle by St.
Francis, Pope Francis begins this encyclical letter. In it, he appeals to us for a new dialogue about how we are shaping the future of our planet saying “We need a conversation which includes everyone, since the environment challenge we are undergoing, and its human roots, concern and affect us all.” Come join us for this day of discussion, study and reflection based on Pope Francis’ call to each of us to recognize the urgency of our environmental challenges and to embark on a new path that brings with it hope in our future. Presenters: Sr. Theresa Ahern, MSBT and Sr. Mary Matthew Labunski, MSBT have served in various ministries as Missionary Servants of the Most Blessed Trinity, as well as serving on the MSBT Peace and Justice Committee. Fee: $30 (includes pastries and coffee upon arrival and Noon lunch) Please call 256-350-1830 or email: mbcretreat@msbt.org one week in advance to register.